Greatest innovation to the singing experience since karaoke was invented. 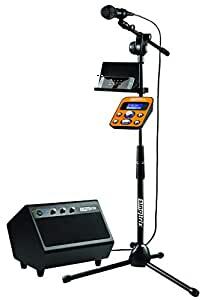 Only patented plug & play karaoke machine powered by live vocal effects technology once only available to the pros. Helps make bad singers sound good, good singers sound amazing! Designed to feel like a concert performance & sound like a recording studio. Over 300 effects. Covers every genre and generation of music. Offers 3 levels of enhancement from beginner to pro.